Supaprice - Buy from UK & US receive in Uganda within 10 days! Are you looking for products from the UK or US but have no credit card, afraid of fraudsters, or high delivery costs? We can help. Example: Total quote (including item cost, shipping and taxes) = Ush 10,000. You pay Ush 5,000 and balance on collection. Click on the image below to learn more and find the best stores to buy from the UK! Click on the image below to learn more and find the best stores to buy from the US! Our business model is high volume, low margin and low overheads. This enables us to save costs and pass on the savings to you - the customer - in the form of low prices. To confirm your order, you pay 50% as a deposit and the balance on delivery. You can also pay instalments if required. All our known competitors ask for 100% upfront! 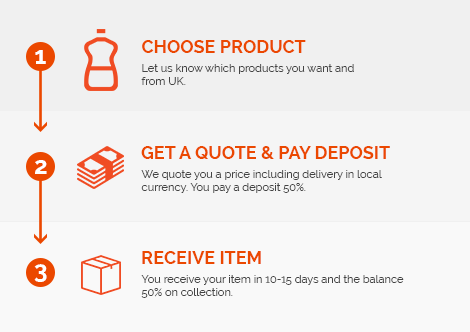 All our quotes are in local currency and include all costs thus there are no suprises on collection / delivery of your items. Click here to read or close the FAQs. The way we work is like this. You let us know what item you want. If you know where to find it, you send us a website link where to buy it from. If not, we look for it from the UK or US and send you a quote. The quote includes cost of the item, shipping and local taxes. It is the final price - you won't have to pay a penny more. If you agree with the quote, you pay a 50% deposit. We then buy the item and ship it to you. On arrival, we let you know when the item has arrived and on collection you pay the 50% balance. For UK orders, we ship weekly and the items arrive within 10 - 15 working days. For US orders we also ship weekly and the items arrive within 10 - 15 working days. We also provide a customer account on our website where you can track the status of your orders. All our quotes are in local currency which you can pay via mobile money, cash or bank deposit. Please contact us as above for details. No, you don't need a credit card. We buy for you therefore you don't need to worry if you don't have a credit card OR the UK / US seller won't accept credit cards from Uganda. Yes. You need to notify us and return it to us on the same day as it is received or collected. Please note that the customer is responsible for the costs to return the item back to the UK or US. In any case, we will endeavour to assist to make it as easy as possible. Does the quote include shipping and taxes? Yes. The price we quote is inclusive of everything i.e. cost of the item, shipping and taxes thus giving you the door-to-door price to help you compare prices easily. Are there any prohibited items you can not ship? In most cases we can ship most things but yes there are some items which we might not be able to ship. We will advise you once you submit a request for quote.